My New Travel BFF-Perfect for Cars, Trains & Planes. Sometimes I discover a charming off-the-beaten track country inn or a hidden cubby of a restaurant that serves French Laundry caliber food for “Golden Arches” prices that I am really torn about divulging because after the swarms of people attack,inevitably prices go up, service goes down, reservations are needed…blahblahblah. But in this case, it won’t matter because I already have my Travelrest to curl up next to. For years I have been searching for ANYTHING that makes a coach seat feel like less of a coach seat, AKA Torture Chamber. I’ve tried blow up pillows of all sizes and shapes, back rests, even one full scale inflatable bed that was supposed to rest on top of your whole seat, (I don’t know what planes their developers flew in but after my bed was inflated there was only about 3 square inches of space left for me!) and all of these ended up in my Goodwill pile. With little hope I opened the box containing the patent-pending “TravelRest-The Ultimate Travel Pillow”. Eureka! I could just kiss John Mittelstadt (see below) for designing this snazzy little guy. Plus, it folds up very small, is sooper light, and inflates with just a few puffs. 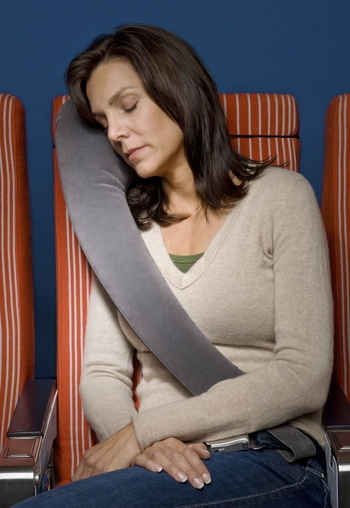 For $26.95 it turns a coach seat into….well… at least a much comfier coach seat. If you’re like me, you find it difficult to sleep while sitting upright (Research shows that sleeping upright takes 50% longer – if you’re comfortable). The TravelRest pillow was born from necessity. What I truly desired was something I could lean my entire body into, and at the same time rest my head against without falling over. One day…on a flight to the far east, I decided to tether my airline pillow to my seatback using my shoelaces. Eureka…my first TravelRest! After years of research and design TravelRest is now available; so make the best of a cramped flight or long drive. Our patented shape and unique tethering system delivers comfort, style, and ease of use.